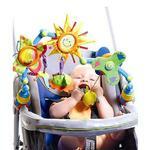 The Sunny Stroll arch stimulates your baby’s vision with its colorful toys swaying in front of his eyes and other visual stimuli on the arch itself (the sun and the birds on the plastic wings). The crinkle and rattle sounds stimulate hearing. The various materials and fabrics (different types of plastic and selection of fabric textures) stimulate touch.